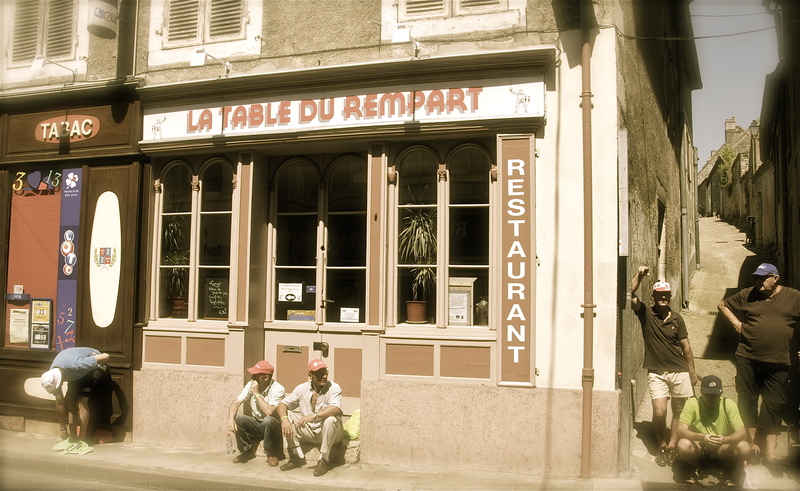 An authentic slice of French life. 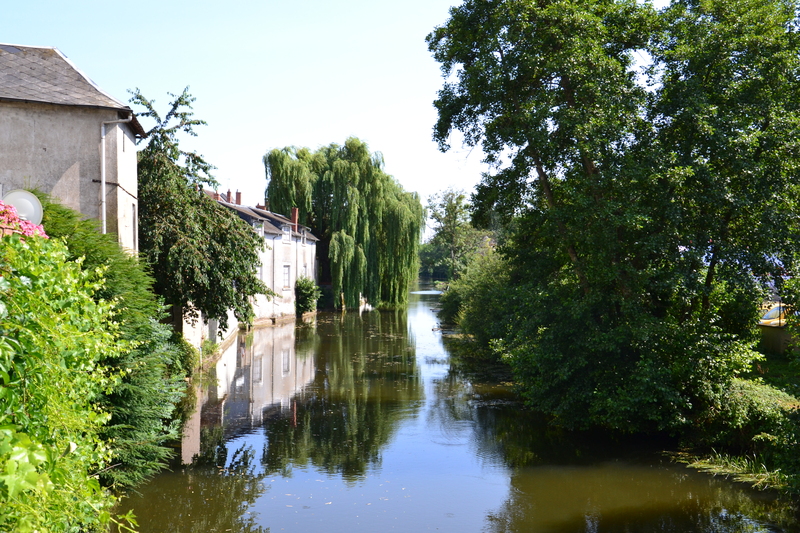 This afternoon, we headed down to the picturesque village of Châteauneuf, nestling on the banks of the Cher river, to catch the Tour De France. 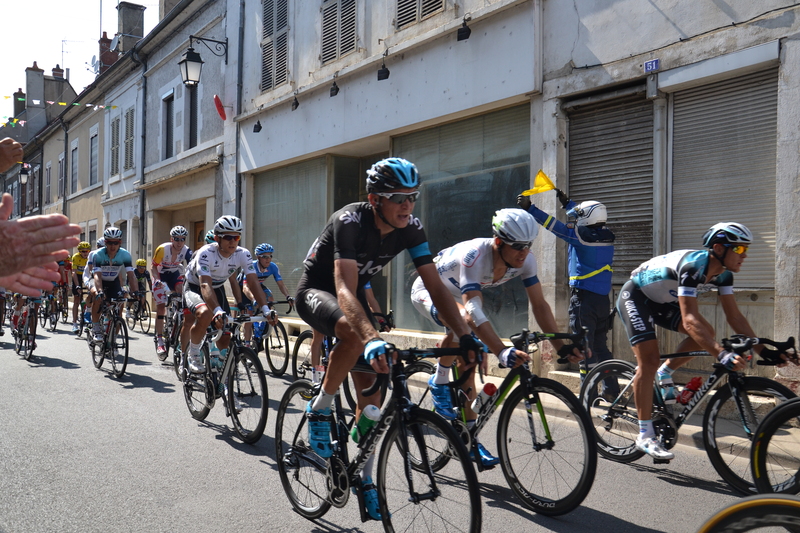 The world’s most famous cycling race came within spitting distance of my front door, so, with nothing better to do … I’m not a great fan of cycling, but this is France’s greatest sporting event and this is the hundredth race. So, we driving along the winding country roads – bordered on each side by wheat fields, where huge, harvesting machines are churning up the dust as they bring in the harvest. On the road, Unwieldy leviathans they may seem, but in the fields they wheel and turn with a ballet-like grace. In the distance the spire of the Chateauneuf’s huge Church rises like some kind of kitsch gothic finger from the flat landscape. I would have expected thousands of people sweating it out in the dry July heat, crushed like sardines up against metal barriers. BUT it comes as a pleasant surprise that It is all free and very informal. People line the pavements with no more than a couple of Gendarmes and their own common sense stopping them from leaping out into the road. There is an endless stream of cars and finally the “caravan” arrives – a full hour before the cyclists themselves, the caravan is the “vanguard” of the race – floats, cars and vans from the numerous race sponsors precede the race in a colourful and seemingly endless cavalcade As they drive past, nubile young ladies in tight T shirts sitiing on the back oif the floats, chuck “freebies” out into the public: – plastic Festina watches, small bottles of Vittel mineral water – pens, sun hats, condoms, bags of sweets, badges – and other such crap. The kids go wild. They have come for this as much as they have the race itself. The caravan gone, spectators criss cross the road heading for the toilet or one of the numerous watering holes – what the French call “une buvette”- selling sodas or gassy beer. It’s hot, and the group of spectators next to me have enjoyed quite a few beers. All along the street, families are eating picnics. Sitting on the kerb or on deck chairs and camping stools. Some of the local residents have literally brought their armchairs and sofas on to the pavement. All very informal. And as we wait there is an endless stream of cars – news crews, sponsors, technicians – god knows. There are probably more cars than bikes. “That’s a lot of petrol for just one cycle race” says an old bloke next to me. And soon the “Tour” arrives. One blink and you’ve missed it. 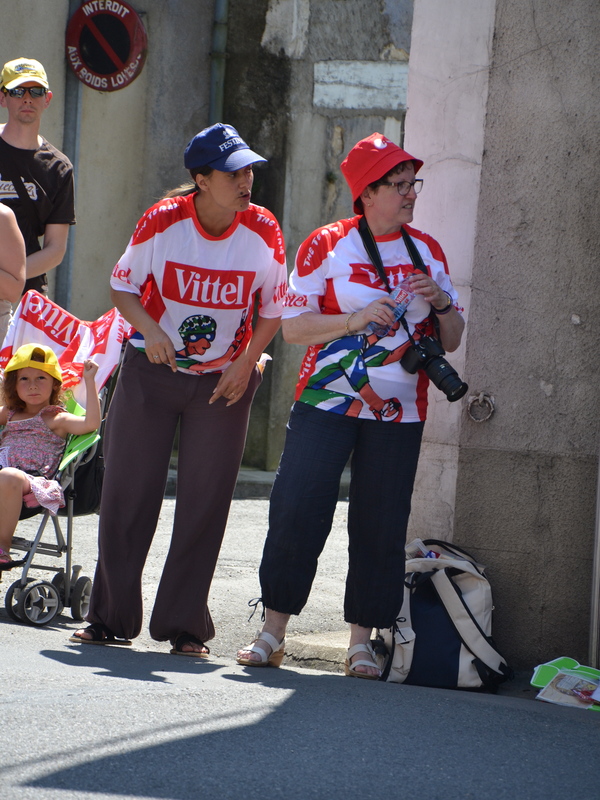 The crowds cheer enthusiastically as the riders pedal through, and then it’s back to the” buvette” for some fans, whilst others fold up their deck chairs and go home. 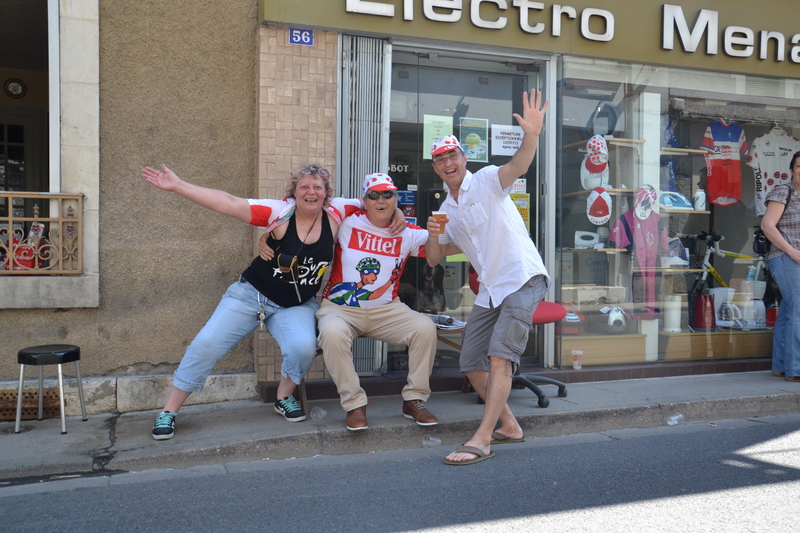 So, that was the Tour in deepest rural France. 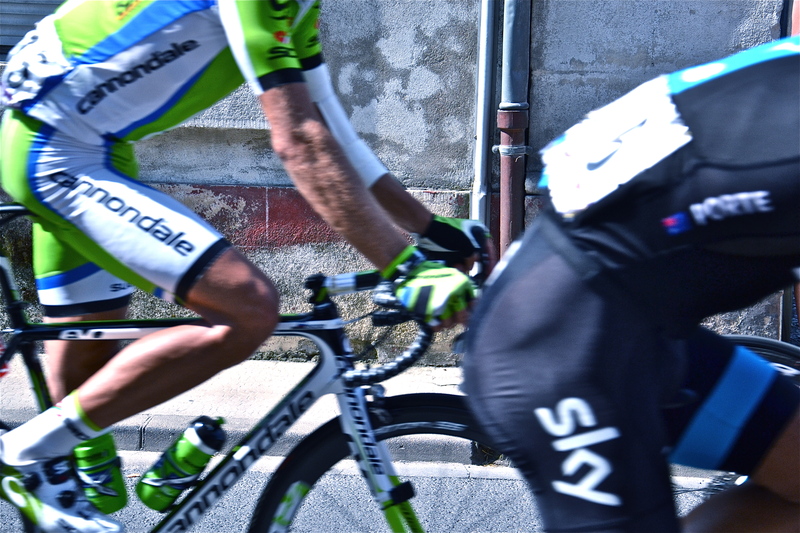 A long way from the finish on the Champs Elysées. Here you can really see the riders, and away from the Parisian chic, this is an authentic atmosphere. Of course, unless you have some really decent photo gear and an excellent vantage point, a lot of your Tour photos are going to look like this. 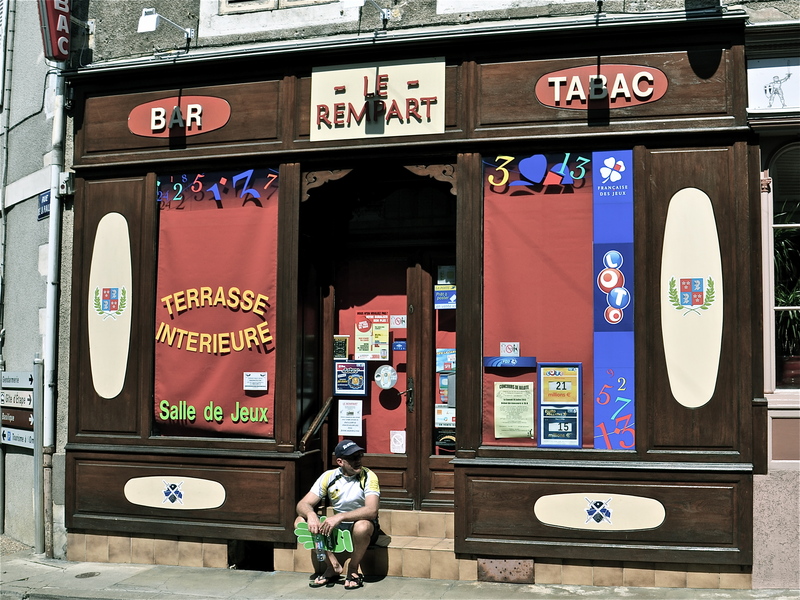 Posted in Culture, Heritage, Sport and tagged Chateauneuf sur Cher, cycling, French life, Tour de France. Bookmark the permalink. During the 2010 Tour they rode through Veaugues, and I decided I was not to miss such an opportunity. The only thing I saw, after waiting 30 minutes on the road side half-way between Montigny and Veaugues, was something looking like a shoal of silent herrings, pedalling up a hill faster than I would have cycled it down.